It breaks relativity as all FTL must; my question was aimed at whether or not the Outsider-verse FTL is exploitable as something that can cause serious paradoxes relevant for the characters. As far as I am aware, all these schemes showing FTL completely breaking sanity by producing unsolvable paradoxes are predicated on the existence of effective FTL communication (which Outsider doesn't have) and unlimited FTL (in the sense that you can travel arbitrarily, like, say, with warp drive in Star Trek). 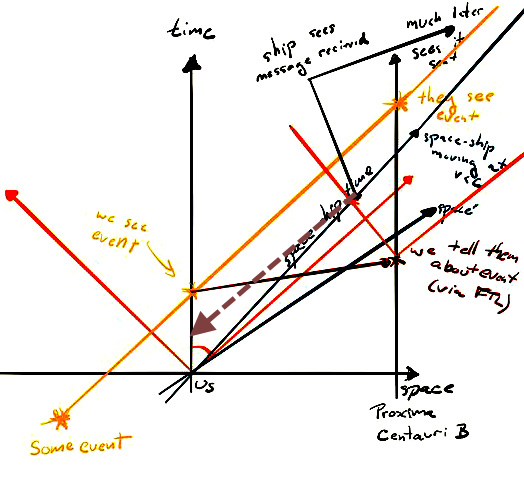 Even then, they usually need to involve a ship moving at relativistic velocities for time paradoxes to occur when this ship perceives effect preceding the cause and communicating this via FTL communication. 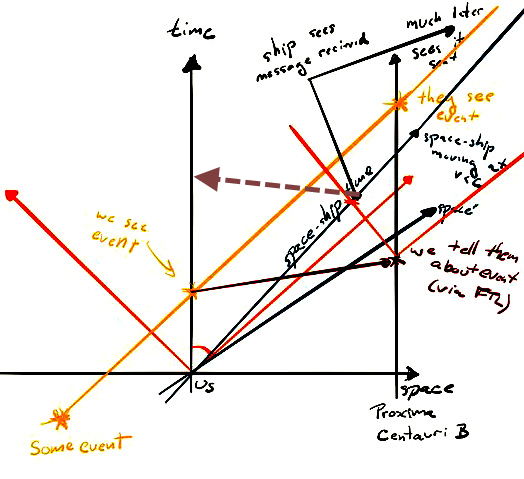 In Outsider, a ship moving at relativistic speeds in relation to local space (say, the Leido-Sala theatre) may perceive significant causality violations occurring all around, but it has no means of communicating anything it sees back to base in time to make a difference, hence why this cannot be used e.g. to warn the Loroi fleet of Umiak invasion before it happens and cause other kinds of weirdness. A good indicator usually is whether Arioch has posted a WiP. Oh well, I'm looking forward to the double update next week. "Do not my friends, become addicted to weekly updates! They will take hold of you, and you will resent their absence!" Today were hauling Aqua cola﻿! Immortan Jim! The old saying is "FTL, Relativity, Causality, pick two." It's relativity that introduces the causality issues. The FTL scheme in Outsider isn't anything special in that regard. "Unlimited FTL" as you call it is not required to violate Causality if Relativity holds. A loop of fixed wormholes is enough. FTL travel is FTL communication, unless the FTL travel does something like scramble everything into completely random stuff, in which case it's kind of useless as a method of travel. *waves cane* I still consider a year with a single update to be a good year. Having stuck around here for well over a decade, through the Great Hiatus, I have been Pavlovianly conditioned to always be pleasantly surprised when Outsider updates. How does FTL as it works in Outsider break causality? I suppose you can see your past self or receive radio transmissions from your past self, but that's about it. If you do a hyperspace jump into another star system, say, 5 LY away, and after 5 years look at your origin system with a powerful enough telescope, you will see your ship as it is about to jump. Same way you will be able to receive any radio transmission your past self sent out if it's strong enough and aimed correctly. Not sure if that counts as a causality violation, but it definitely is a form of weird FTL side effects. That can't be it. Then going supersonic and allowing the sound to catch up would also violate causality. Seeing yourself through a telescope 5 years ago does not break causality in any meaningful way. Causality is broken when you can see events from the future or influence events in the past. Technically, any faster than light travel through spacetime breaks causality because the speed of light is actually the speed of causality within spacetime. However, this doesn't mean it's impossible for two objects to move relative to each other faster than light; in fact, the current theory of of the Big Bang (specifically, Inflation theory) requires that spacetime itself expanded much faster than the speed of light in the early fractions of a second after the Big Bang. Faster than light travel within the confines of flat spacetime is impossible, but you can travel faster than light away from another object if the spacetime itself between you stretches faster than light (as in cosmic inflation), or if you locally warp spacetime (as in an Alcubierre warp drive or a wormhole), or if you leave spacetime altogether (as in hyperdrive or jump/fold drive). The problems for causality happen when you pair relativistic velocities with some sort of instantaneous communication or teleportation. For example, if you have two locations connected by an ansible which can communicate instantaneously, and one location is aboard a ship that is traveling at a high fraction of the speed of light, then the two points experience different rates of time despite being in communication with each other, and potential causal hijinx ensue. However, the way jump drive in Outsider works avoids such problems. Travel through hyperspace is not instantaneous, and ships in hyperspace do not experience extreme time dilation, and ships in hyperspace are blind to events in real spacetime, and the endpoints of the jump are so far away that there can be no meaningful causal interactions between them on the time scales of the jump. And no, there's nothing unique about this FTL scheme. The issue with FTL travel and causality is in large part because of the phenomenon in relativity that is commonly described as, "Simultaneity is Observer Dependent." If you take for example, a jump between Sol and Barnard's Star, the jump would need to take about 2.11 seconds, to prevent the possibility of a ship jumping one way, sending a message to a ship on the other side, and having that ship immediately jump back prior to the first ship's departure. Barnard's Star is 5.958 light years away, and traveling at 142.6 km/s relative to Sol, for example. We can derive from this the amount of time it would take a laser to bridge the distance as the amount of time the jump would need to take in order to jump directly to the object without risking a paradox. The snooty dark-blue-haired one with the twisty-plaits.... she forgot to switch her suit to nightlight-mode at the bottom of the page. So I did, thanks. Should be fixed. I'd argued with people over similar complaints, and never got a satisfactory answer. According to the argument, all FTL travel breaks the universe. My view: A paradox requires that you go backwards in time. If all frames of reference (start point, starship, and destination) are moving forwards in time, then there is no way for a warp drive starship to go to another star system, return to its point of origin, and have arrived before it left. ProjectRho gives the example of a relativistic ship going between Earth and Proxima Centauri. Earth sends Proxima a message by FTL comms. The relativistic ship sees the message arrive at Proxima before it is sent from Earth. Fine, that looks kind of weird. if the ship had a FTL phone set up in the right way, they could call Earth before Earth placed the call. I don't get it. They see the call arrive. The FTL phone doesn't send messages backwards. 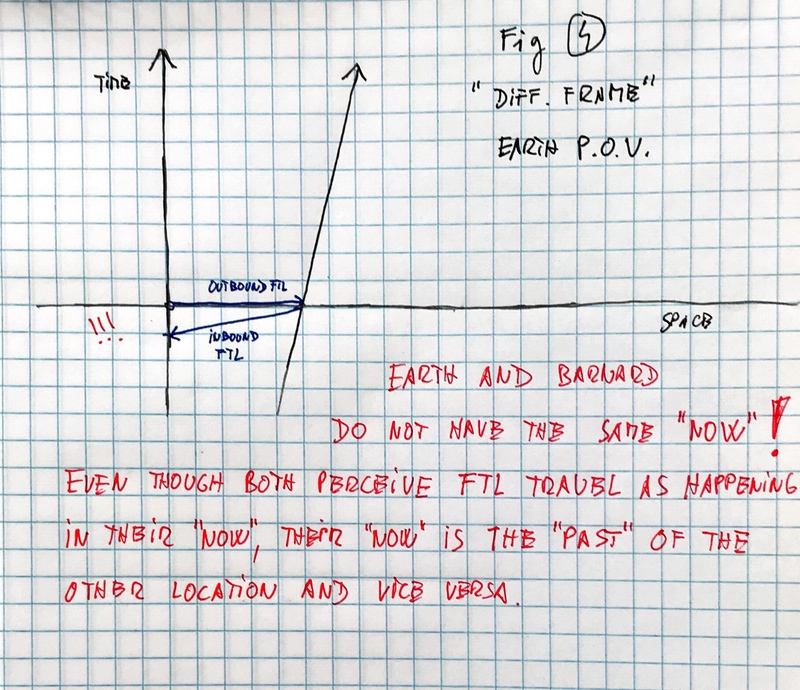 I can see how the second one might be right if the FTL communicator was near instantaneous, as the earth-proxima line suggests... but how does an FTL drive that goes at a certain speed relative to the universe fit into that? Say the relativistic ship sees the message, powers up a warp drive and decides to go to Earth. Why does that result in it arriving before the message left, if its all going forwards? 2:30 AM is way too late at night for me to be thinking about time travel. This is sort of the point, there is no universal constant, no privileged reference frame, every reference point is relative to every other reference point. There is no universal "now." 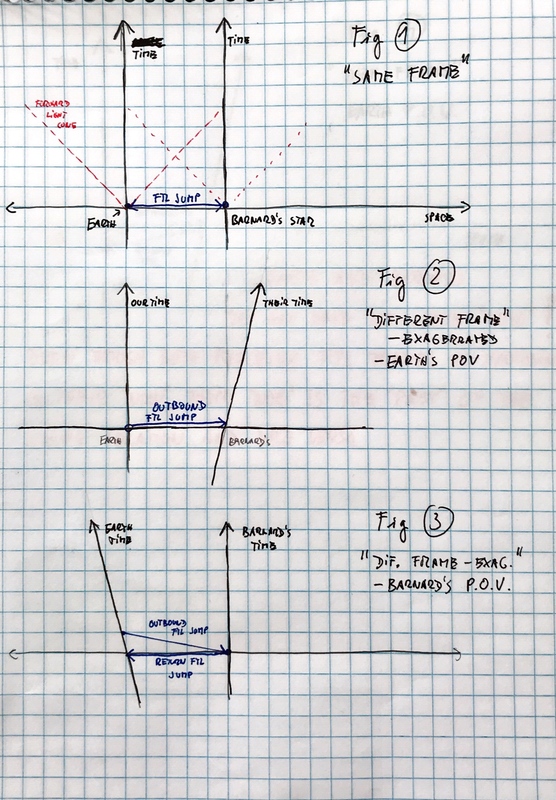 What is happening right now, from one person's perspective, could be happening a week ago, from someone else's perspective in a different reference frame. Relativity of simultaneity is something that science has tested extensively, and has very solid evidence. From the relativistic ship's point of view, it is going to Earth "now," for it's definition of "now," but the message it received hasn't been sent yet, in it's frame of reference. But the moment it arrives at Earth, its frame of reference adjusts to Earth's frame of reference, where the message *has* been sent in its past. Kinda making the point mood if you ask me. It is perfectly normal for people to return home before the postcards they sent back home arrive, it is hardly a causality problem, just the mail being a bit slow. I see it the same way with a ship that make an near instantaneous jump ahead of the slow light speed radio message sent just prior to the jump. In RedDwarfIV's hypothetical example of a transit between Earth and Proxima Centauri, it is also important to point out that there is no single "Earth's reference frame," but rather there are a series of reference frames over time, none of which is preferred over any other. Time is a series of events in space-time, the progression of which depends on the observer's frame of reference. This has nothing to do with the problem at hand. The matter is not people arriving home before their postcards arrive, but their postcards that they sent from their destination arriving back home before they leave in the first place. Relativity of Simultaneity is not an optical illusion, it isn't merely an issue of people experiencing latency, it is a fundamental quality of how the universe operates with regards to the speed of light. Time Travel makes my head hurt. Personally, while I rarely have enough grasp on the relativity issues to explain it, I take it as a general rule that FTL will enable time travel if you try hard enough, though some schemes may make it very hard to create testable breakage. I suspect with Outsider's setup you'd need to drag stars up to dialation-inducing relative velocities and then jump between them to really get spectacular results, which puts the bar for time travel pretty high. I never rule out someone clever than I coming up with an easier exploit, though. That relavistic ship clock still adjusts to Earth's frame of reference once its goes down from its high relative velocity relative to Earth. It's simply not practical to maintain its own clock once it joins another objects frame of reference. And since in this case it is the smaller object so to speak, it should abide to Earth's. Besides, it decided to power up its FTL *because* of something received by its eventual target (Earth thus). Every object always has its own frame of reference. That frame of reference may agree with another frame of reference nearby, but there is no special connection. Size isn't relevant, time measuring devices aren't relevant, only velocity and position are. It doesn't matter if the FTL ship matches velocity with the Earth after it arrives, because it has already arrived before the message was sent in the first place. The only thing that changes when it agrees with the Earth's frame of reference is that it now seems to have traveled from its own future. It can only arrive before that message was sent as seen from within its own timeframe, but to me that timeframe becomes irrelevant the moment it enters Earth's timeframe again. We simply see it different on that point, Icekatze. but to me that timeframe becomes irrelevant the moment it enters Earth's timeframe again. Earth does not have a single, objective time frame. It is relative. That is how the science of relativity works, it's not just a matter of opinion. We're not obliged to have this out here and now, but anyone can do the math and run the proofs themselves. See the paradox? 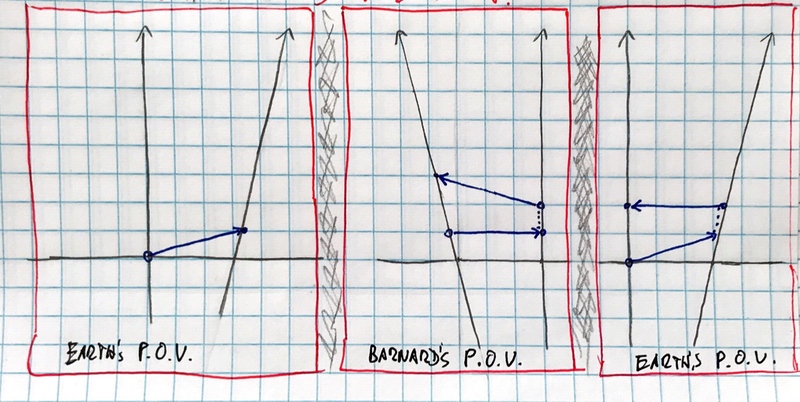 You may think this is a trick, and it sort of is, but the point is that for relativity to be correct, and we know it is correct because of numerous observations, this paradox WILL occur: although both observers believe they're communicating instantaneously in the "now", they're in fact communicating with the future/past of observers in different frames. So, what happens if the arrangement depicted above happens and the ship from Bernard's arrives before the ship from Sol even departed, and tells the ship from Sol: "don't jump!!!". A paradox will have occurred: why did the ship from Bernard's jump if the ship from Sol hasn't even departed yet? Now, this is why I asked my original question to Arioch whether he intentionally set up the FTL system in Outsider-verse in order to prevent paradoxes from occurring. If the jump isn't instantaneous and if there isn't an FTL radio, and if the ships need some time to get ready for a jump, and if the stars' relative movements are within the realm of normalcy, it is next to impossible to arrange a sequence of events that would lead to the paradox described above. The ships are still jumping from one star system to the past of other star systems, but practical difficulties prevent this from being exploited to cause a causal paradox (i.e. moving back in time and preventing the event that made you travel back in time in the first place). The ship from Sol makes a non-instantaneous FTL jump; it signals the waiting ship at Barnard's to jump to Sol. The Barnard's ship takes some time to spool up its FTL drive and reach the correct jump speed. When it jumps to Sol, it will arrive after the Sol's ship from Sol's point of view. Paradox avoided, no problem. I quite like this solution.